As a kid being obsessed with Sci-Fi I just had to make the Classic Space ship! This piece is for you! As a kid I was obsessed with sci-fi so it’s only fitting that I was driven to design this classic rocket pendant! It is fabricated from .925 recycled sterling silver with a bullet shaped Red Garnet for the nose cone. 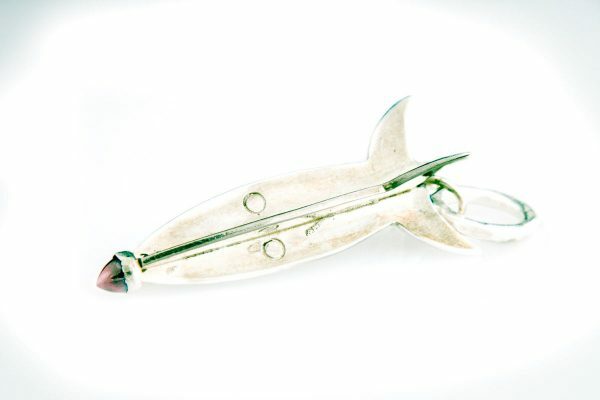 Be careful, you may fly to the moon, or the stars or to your dreams when wearing this lovely rocket pendant. Garnets in legend light up the night and protect their owners from nightmares. Garnets have long been carried by travelers to protect against accidents far from home. She measures 2 1/8 inches long and is ready to transport you far far away !!! ::: This particular piece is made to order. Because each piece is a hand fabricated original object d’art your piece will look slightly different, but just as perfect as the one pictured. I also love to make custom pieces to your spec … please contact me and we can discuss what you need. ::: If you need a sterling silver chain please check here for a selection.